This box contains Beethoven’s five Piano Concertos performed by Hannes Minnaar, with The Netherlands Symphony Orchestra under the baton of Jan Willem de Vriend, across 3 SACDs. The Third Concerto is released here for the first time. 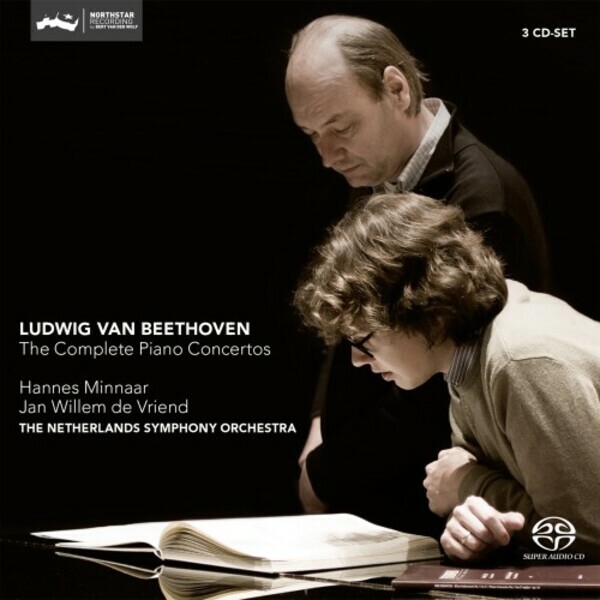 Hannes Minnaar is now recognized as a leading pianist of his generation after these Beethoven's recordings, but also following his very successful Fauré recital (CC72731) and his recording of all Beethoven’s Sonatas for piano and violin with Isabelle van Keulen (CC72650). Previously two single volumes of the Piano Concertos have been issued in this series. The first, which included Concertos Nos. 4 and 5, was acclaimed by Gramophone: “Beginning a Beethoven cycle with the Fourth and Fifth Concertos is a bold move but one that pays off in all sorts of ways.” The same magazine welcomed the disc of Concertos Nos. 1 and 2 for “its pleasing mix of finesse and drive”. Despite the very large number of recordings already made of this musical corpus, Minnaar and de Vriend have proved that they have something new and totally their own to say about this collection of masterpieces. And it is indeed the peculiar blend of sheer energy and esprit de finesse that can be identified as the distinctive brand of these recordings.